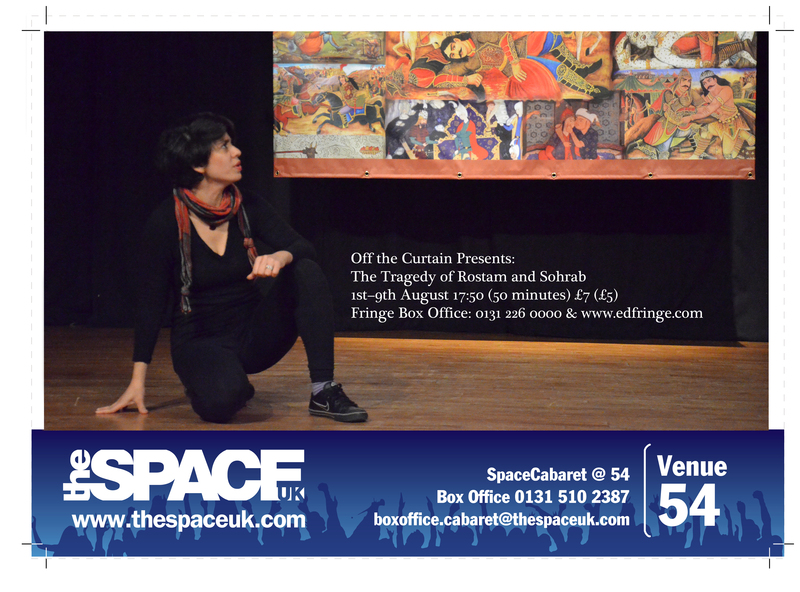 Off the Curtain is a solo project of Sara Mashayekh, relying on the innovative means of performance to bring old stories back to life. Breaking with the traditional storytelling method of Pardeh-Khani (literary off the curtain), including replacing the traditionally male performer with a female one, this project brings together an age old story with a new way of performance and narration, interacting both with the audience and the painted curtain, off of which the story is illustrated. The Tragedy of Rostam and Sohrab was showcased at Stage Werx in San Francisco on April 20th. You can learn more about the process of the creation and first public performances of Off the Curtain: the Tragedy of Rostam and Sohrab, here. A previous run of the show was kindly reviewed by Six Pillars, providing some additional information and background to the story. Some reflections on the Shahnameh, including the story of Rostam and Sohrab, at Encyclopaedia Iranica.